As every trend-setter knows, choosing the right footwear and accessories is key to planning the perfect outfit. And with a Spartoo.co.uk voucher you can pick the best of the bunch without breaking the bank. Whether you're looking for a smart pair of flats to complement a formal outfit or a casual pair of trainers to keep you comfortable on the tennis court, a Spartoo.co.uk voucher code will save you money while you shop. Spartoo.co.uk was formed in 2006 when 3 friends – Boris, Paul and Jeremie – sought to combine their love of shoes and the internet into an exciting and forward-thinking online shoe store. Taking their name from the famous Roman Sparta sandals and adding a modern twist, Spartoo.co.uk set out to become an innovative and modern shopping platform that would transform the way we buy our shoes. After winning the support of investors, brands and partners with their fresh ideas, Spartoo.co.uk launched to great success, growing from a team of less than 10 employees to a vibrant company of more than 180 people based in the French Alps. They have a presence in more than 20 countries including England, France, Germany, Italy and Spain, and work with almost 1,500 brands to offer customers an unrivalled selection of top quality footwear for all occasions. At Spartoo.co.uk customers can browse a wide range of footwear and accessories, all available to search by category or by brand – so it's easy to find exactly what you're looking for. Along with the selection of footwear and accessories that the company is known for, they also stock a range of men and women's clothing from some of the world's favourite brands. Looking for a pair of heels and a cute dress for a big night out? Spartoo.co.uk has a wide range to choose from in every style and size. Or perhaps you're searching for the perfect pair or trainers for relaxing and running at the weekends? Take your pick from a selection of iconic designs from brands like Nike, Diesel, Dr Martens, Vans, Camper, Converse and more. All of Spartoo.co.uk's products are available with a 30 day free return policy, so you can take your time to decide on what's right for you, and standard UK delivery is free on all orders. Want to get shopping with Spartoo.co.uk? With a Spartoo.co.uk voucher you can enjoy fantastic savings on their wide range of shoes, accessories, clothing and more. So whether you're looking for a brand new pair of shoes for a big night out or a total wardrobe overhaul, Spartoo.co.uk voucher codes will help you look great for less. Browse our website until you find a Spartoo.co.uk voucher that suits you, then navigate to their website to begin shopping. Enter your email address and click 'Continue' to open an account. Sign in with your new account details. Enter your Spartoo.co.uk promo code in the box provided and click 'OK'. Want to find out more about stylish shoes and accessories with Spartoo.co.uk? Why not pay a visit to their dedicated YouTube channel here? You'll find lots of exclusive content including new collection previews, behind the scenes videos and more. You can also use this channel to find out more about saving money with a Spartoo.co.uk voucher code. If you've enjoyed shopping with Spartoo.co.uk, you might also like to check out more great deals on footwear and more at stores like Schuh and TK Maxx. Or, if those aren't up your street, you'll find plenty more deals to browse in our Fashion, Accessories and Jewellery section. Enter your payment details and click 'Confirm' to complete your order. If you need to return a product for any reason to Spartoo.co.uk, you can do so by simply returning your items in their original condition within 30 days of receipt. Need to speak to the team at Spartoo.co.uk? Whether you have a question about your order, want some expert advice on top brands or just want to find out how your could make fantastic savings with a Spartoo.co.uk discount code, you can contact the Customer Services department by telephoning 020 30 264358. Want to discover more from Spartoo.co.uk? Why not follow the company across your favourite social media platforms? You'll enjoy access to lots of interesting content including competitions, special offers, fashion tips and much more. You can also use these pages to find out more about saving money with Spartoo.co.uk voucher codes. Don’t forget to check them regularly, as you can never be sure when a free Spartoo.co.uk voucher might be waiting for you! Buy now online at www.spartoo.co.uk. I love to shop for the latest fashions, but don't always have much money to spend. That's why it was great to discover a Spartoo.co.uk voucher online. 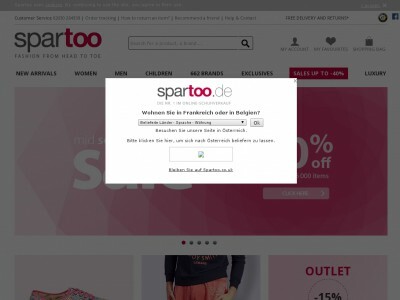 With Spartoo.co.uk voucher codes you can get fantastic discounts on a wide range of shoes, clothing and accessories from all the top brands at spartoo.co.uk. I used my Spartoo.co.uk voucher code to get an amazing price on some gorgeous new Nike trainers – and saved enough for a new handbag too! So why not treat yourself with a Spartoo.co.uk discount code?